Local co-op is great. You get to sit down with friends, play some lag-free games, and save your best curses for online co-op. The catch is that you have to haul everybody over to your place to get said gaming sessions going. Worse still, you usually have to put on pants for those sessions, and that's just not right. Good thing Nvidia is working on something that might fix that limitation. Along with the GTX 950 release, Nvidia plans to roll out an update to its GeForce Experience software that adds a featured called "Share". Share works by streaming a gameplay video to a friend using a direct, encrypted stream, kind of like PS4 Share or OnLive. Your local machine runs the game and accepts controller input from your buddy's PC, allowing them to play as if they were sitting in the same room. The game thinks multiple people are connected to the same rig, allowing you to play couch co-op modes in a non-local environment. 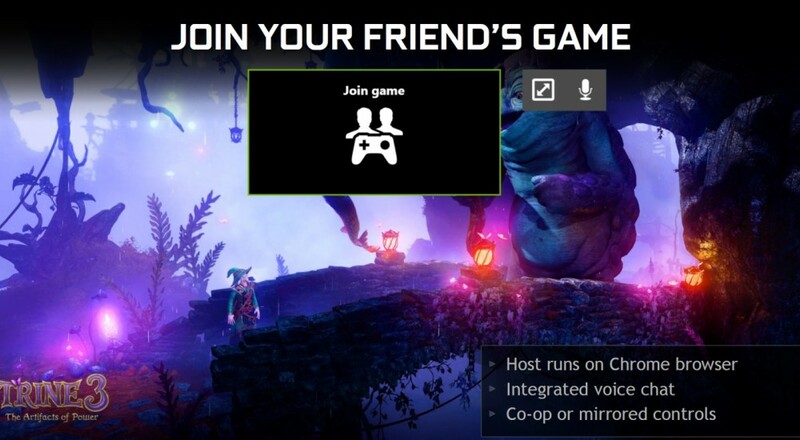 Nvidia's Share technology, which is called GameStream Co-Op for our specific purposes, is still under development. Sadly, latency is still a big issue, with a visible delay of one to two seconds between controller input and feedback from the \stream. Not so good for racing games or anything that requires split-second timing, but it could work as-is with puzzle titles or slow paced co-op games. Twitch and YouTube streaming is also part of the Share package, which shouldn't be as handicapped by the slowdown. And here's the real catch: game developers are worried GameStream Co-Op could be used to stream entire games to people who don't own the title, amounting to a kind of super cool futuristic piracy. To combat this, the current version of GameStream Co-Op shuts off after an hour of play. Hopes, deleted. Hopefully some sort of verification can be incorporated that checks to see if both players own the game, then lifts that time limit for unrestricted play. Who knows. Nvidia hasn't announced a release date for Share, but early builds should be out this month. Don't throw your pants away just yet.